It's the season when we look in the rear view mirror over the past year and begin to establish our vision for the New Year. It is a time of hope relative to the good things to come. It is fascinating to see that these same four areas are issues for teenagers in Nicaragua and around the world. Nicaragua is the second poorest country in the western hemisphere, where more than 65% of the population lives in poverty. Yet, despite the differences in environment, Nicaraguan teenagers relate to the pillars of Lifeplan: A Journey of Choices, Decisions and Consequences. Local leaders realize the importance of building future leaders who will make decisions that break the destructive cycles of the past. A total of 10 leaders from 5 communities raised their hands to be the first to start the Lifeplan program in their respective communities. Cindy went to work preparing the plans to deliver the first part of the Train the Trainer session in Spanish. "Going in, we thought if 6 of the 10 leaders show up, it will be a good start," Cindy said. "We were blown away when we arrived and saw 14 people in the classroom ready to start working." The leaders were fully engaged during the 2-day session, took copious notes and had a solid plan for how they would start to deliver Lifeplan in their communities. Afterward, they wasted no time in starting their weekly programs with teenagers. The leaders said: "Lifeplan will help us to start conversations with teenagers about things that are not discussed in our culture. By opening the door to this dialogue, our young adults' faith and confidence will be strengthened, resulting in better decisions and a better future." In February, Cindy and her team will return to Nicaragua for the second Train the Trainer program. 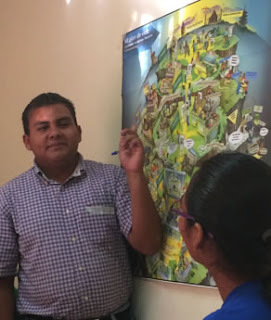 Then in April, the leaders who have demonstrated the skills of a Lifeplan facilitator will be certified to train additional teenagers in Nicaragua. In addition, graduation will be held for teenagers who have met the attendance standard and have demonstrated commitment to their personal growth. After that, a sponsor program is being considered to help the Lifeplan graduates gain the skills through education that would not normally be available to them. The gift of hope is offered through the empowerment of young adults, and Lifeplan offers the right platform for this to happen. The benefits will continue well into 2016 and beyond in Nicaragua. If you are interested in knowing more about the initiative in Nicaragua, contact Cindy Domanowski at cindyd@perciostrategies.com.